Sweet and Spicy Mixed Nuts make a wonderful appetizer, perfect for cocktail evenings and parties. This post comes with a warning: These nuts are incredibly addictive! 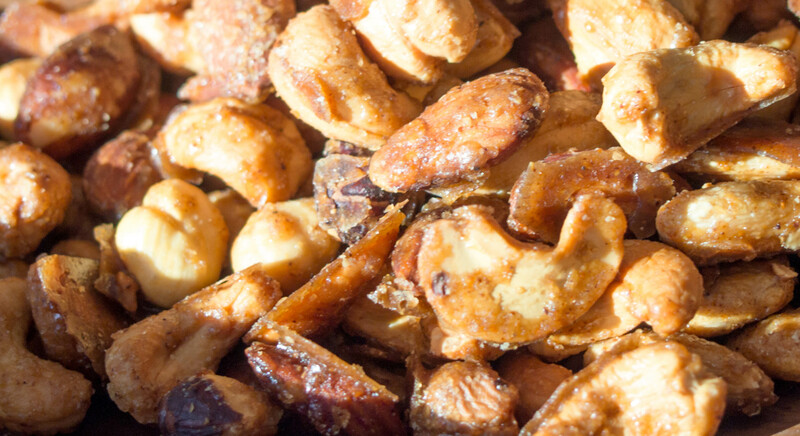 They’re sweet, salty and spicy so if you like that combination then you will love these nuts! I love serving these nuts at casual gatherings and even at holiday get togethers. You can make them look all fancy by serving them in martini glasses! I used different unsalted nuts to make this recipe, almonds, cashews, pecans and hazelnuts. My mix didn’t contain any walnuts but I’m sure they would taste delicious as well. What’s good about this recipe (other than how tasty it is) is that it can easily be doubled. Enjoy! Spread the nuts in one even layer on baking sheet. Bake the nuts in the oven for 10 minutes, stirring the nuts once after 5 minutes. Bake for another 5 minutes until they begin to lightly toast. While the nuts are toasting in the oven, melt 2 tablespoons of butter in a small saucepan and add the salt and spices. When the mixture begins to foam add the sugar and maple syrup to the saucepan, whisking until all ingredients are well combined. Keep the spice mixture on very low heat until the nuts have toasted for 10 minutes. Pour the spice and sugar mixture on the nuts, toss well to coat evenly and return to the oven for 10 minutes, stirring the nuts and breaking up the clusters after 5 minutes. Remove the nuts from the oven, stir them again breaking up any large clusters and let cool completely on the baking sheet. The nuts will get crispy as they cool. Store them in an airtight container for up to one week.